Take yourself back a couple of decades and the IT industry looked very different than it does today. Back then the number of solution choices was relatively limited and only available to those with the finances to afford it. Many of the core services had to be built from the ground up. Why? There simply wasn’t the volume or maturity of the IT marketplace for core services. Today, that picture is very different! For example, consider email. Back in 1995, Microsoft Exchange was just a fledgling product that was less than two years old. The dominant email solutions were cc:Mail (acquired by Lotus in 1991), Lotus Notes (acquired by IBM in 1995) along with a myriad of mainframe, mini and UNIX-based mail servers. Every enterprise had to setup and manage their individual email environment. Solutions like Google Apps and Microsoft 365 simply did not exist. There was no real alternative…except for outsourcing. In the mid-late 90’s outsourcing became in vogue as a means to divest the enterprise. The theory was centered on economies of scale and expertise that most enterprises simply did not possess. Back then, IT was squarely seen as a cost center. Unfortunately, outsourcing did not deliver on the promise. It was an expensive, opaque option that created significant challenges for many enterprise organizations. Even today, these wounds run deep with IT leaders when they think of leveraging cloud-based solutions. Fast forward to present day. Today, organizations are re-doubling efforts to catapult their position through leverage. This effort brings laser focus upon the IT organization to pinpoint those efforts that derive differentiated value. At the same time, the IT marketplace is far more mature. There are multiple options offered through a number of avenues. A startup company is able to spin up all of their technology services without purchasing a single server or building a single data center. Cloud computing is a key to this leverage point. The intersection of these two dynamics is causing CIOs and IT organizations to rethink their priorities to better align with the overall business objectives. IT organizations are looking for leverage where they no longer have to do everything themselves. This demonstrably changes the dynamic of speed, agility and focus. Enter the consumption-first paradigm. Whereas past IT organizations needed to take a build-first methodology out of necessity, today there is a better option. Today, organizations can move to a consume-first paradigm. Within the paradigm, applications and services are evaluated through a consume-first methodology. If the application/ service is not a good fit, then it moves to a configure-first methodology. If all else fails, it falls to build-first. But the goal here is to consume as much as possible without having to build or configure. The evaluation process is as important as changing the paradigm. It is critical to clearly understand what is strategic and differentiating for the company. That then becomes a hallmark for guiding which components present the greatest opportunity for focus and leverage. Changing the paradigm does not happen overnight. Many will fight the change and develop reasons why consumption is not a good idea. It is important to understand the motivations. From experience, the fundamental concern often comes back to job loss and confusion. For the CIO, it is important to tackle these components head-on. Equally important is to maintain a balance in evaluating the holistic situation. Understanding the impact on people and processes is often harder than the technology shift. I wrote about this two weeks ago with Time’s Up! Changing core IT Principles. Moving to a consumption-first paradigm is not limited to email. It is starting with data centers and core applications (like email) and moving up the stack. The question is: How prepared are you for the coming change. Newer generations of staff, employees and customers are already demanding a different class of services. The evolution has just started. 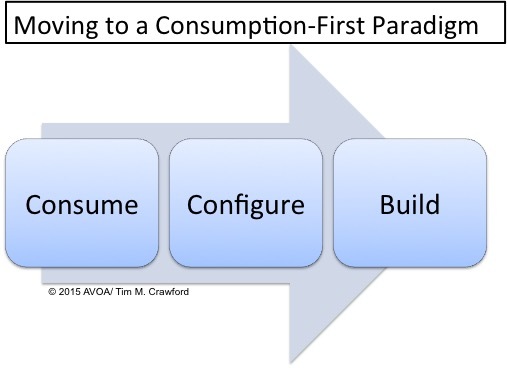 Moving to a consumption-first paradigm is the core component in making the transformation. Ironically, a vast many organizations are still working with paradigms from the 90’s by trying to do it all themselves. In their case, they believe (mistakenly) that they ‘have’ to. The reality is often very different when taken from an objective perspective. Do not get caught flat-footed. Change is already happening and picking up momentum. Unlike past evolutions, this is not one you want to be on the trailing edge of. Previous Does the enterprise marketplace really need a new email solution?